Constipation is a worldwide problem that is very common with people of different ages. Constipation is said to create problems if there are less than three motions per week. The cause of constipation remains unknown in some cases but mostly it is related to foods and lifestyle. Other common causes of constipation are the use of medicines, stress, anxiety or other factors. A healthy lifestyle contributes greatly to the well being of an individual as the immune system will respond as it is treated. Many home remedies have been proved effective for relieving constipation pain which may be tried conveniently. Around 20% of Americans suffer from constipation mainly because of the unhealthy eating habits which involve junk foods. There may be many unpleasant symptoms that people may be suffering from and they can all be treated with easy remedies. Constipation will have any of the symptoms like bloating, hard stools, painful stools, stomach discomfort or not being able to pass stool at all. Constipation can have adverse effects on health if it lasts for a long period of time. Hence, it should be treated as soon as possible through effective home remedies. The following remedies will help you relieve constipation pain and ease any discomfort in the stomach. Dehydration will often make things worse for your overall health. It is therefore recommended to drink at least 2 liters of water every day. It is important to stay hydrated and drink sparkling water to ease constipation. Avoid soda drinks that may worsen your condition and instead opt for healthier choices. Fiber-rich foods are the healthiest choice for your health as they regulate all functions of the body effectively. Soluble fiber is considered most helpful in making bowel movements regular. It is important to include the right type of fibers in the diet as the dietary ones may not work well for other symptoms of constipation. Insoluble fibers include the whole grains and vegetables which make the stools pass easily through the digestive system. 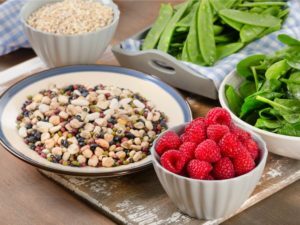 Soluble fibers include fruits, nuts, oats, barley, seeds, lentils, and other vegetables. These types of fibers absorb water to make the consistency of stools better and smooth to pass. Taking insoluble fibers alone in the diet will not be helpful in relieving constipation as it may make the condition worse. While some other soluble fibers may also cause the same problem and so it is important to know which type is best for consumption. It is recommended to take soluble and insoluble fibers both in the diet to be most effective for relieving constipation. Fiber intake for a woman should be 25 grams and 38 grams for men. Oats, bran and rice are high in fiber content and may help ease stool within minutes or couple of hours. What’s another effective food that helps to ease stool is guava. Although bananas are said to help with motions both ways, guava can be a super laxative agent that works within minutes of consuming it. Guava stimulates the bowel movements and speeds up the digestion process. Natural foods are best to treat constipation as they will work effectively without any harm. Fiber supplements may be used when you are not fond of consuming fiber in diet or need an easy alternative of fiber. Fiber rich supplements will help to push out stool and ease pain. Increasing physical activity can help solve many health disorders which also include constipation. It helps make bowel movements and lets the stool pass easily. Getting physically active is the key to be healthy and prevent many illnesses. Exercising regularly will reduce any symptom related to constipation also. While it is also said that some people do not notice any changes even after exercising enough, there is no harm in trying it. Caffeine helps to relieve constipation because of its laxative effects as it helps to stimulate the digestive muscles. Coffee contains some amount of fiber which also plays its role in easing constipation. A herbal laxative known as senna is common with people suffering from constipation. It has been proved useful in improving digestive discomfort and can be taken orally without any side effects. it is safe for adults to use as it will only simulate the gut nerves and bowel movements. Pregnant women should avoid any herbal supplement as it can be harmful to the fetus and its development. Probiotics intake can be useful for constipation as they tend to balance the bacteria in gut to improve bowel movements. Many laxatives are available over the counter or on prescription for constipation patients to find relief from their condition. Those may include bulking agents, stool softeners, stimulant laxative and osmotic laxative. However it is not recommended to take them regularly as they may make your digestive system used to them. A pharmacist can guide you better on what to use depending on your condition. Magnesium citrate is known as a osmotic laxative agent that may be bought over the counter to relieve constipation. It may be used to clean the bowel for other medical purposes also as it has such a strong effect on the body. Prunes are used widely as an effective home remedy for constipation as it contains fiber and laxative agents too. Prunes can be used easily as an effective remedy as they will work instantly to have an effect on the digestive system. However, it is better to avoid taking prunes if you have IBS. Dairy products can stop the gut movements if you are dairy intolerant. This may result in constipation and so it is better to avoid taking dairy altogether if you are experiencing constipation continuously. Constipation can be relieved through stool softeners as the hard stool will no longer be a problem to pass. Stool softeners will soften and smoothen stool so it can be passed without causing discomfort or pain. The most appropriate position of passing stool is the squat position as it corrects the angle of the digestive system and lets it pass easily. It is better to place your feet on a stool while pooping as this will help you a great deal when having constipation. Lifestyle changes will further help you prevent constipation as the bowel movements will get regular. Lifestyle changes will help you notice changes in overall well being as food and exercise is the key to health and fitness. The keys to follow on regular basis are drinking water regularly, consuming fiber, and exercising regularly to keep the body moving. Also, stress has negative impact on the body as the digestive system gets disturbed. It is important to manage stress levels and pay attention to all factors contributing to good health. Also, it is never advised to hold in stool for long as it may affect how the digestive system works. Chronic constipation should be treated by a doctor who may diagnose the condition according to the symptoms and provide required treatment. Make sure to choose the right remedy for hourself as not all of them will suit everyone. Natural remedies are meant to be safe although some may be more useful than others for different people.